The Design Boards: Behind the Design - Oh, My Deer! Welcome to the newest feature of my blog, "Behind the Design." Behind the Design is a look at the designer/creator behind the product. This week features Chelsea Petaja of Oh, My Deer! 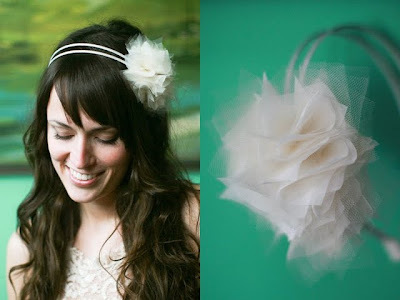 Chelsea designs amazing vintage inspired hair pieces made with feathers and flowers and buttons. 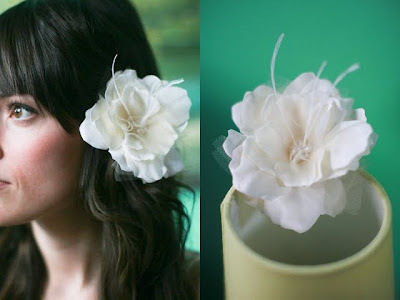 I am definitely planning on ordering one of these lovelies for my own wedding! I have an affinity for things that are beautiful, tiny, and that have a story. Because of that, vintage brooches and earrings are normally what brings me the most inspiration. Also, because each piece of jewelry I collect is one-of-a-kind, the pieces that I make using them are also special and unique; those are my favorite lovelies to create. Do you have a spot that you like to go that helps you feel creative? Where do you do most of your work? My husband and I bought and moved into our first home! It's a small, 1905 Victorian house, and I've set up shop in our spare bedroom. This past Christmas, my husband surprised me with a vintage tailor's table for me to use for Oh, My Deer! It's the perfect spot for me to spread out and get messy with scraps of chiffon and feathers flying! Also with a little Rufus Wainwright, Sufjan Stevens, or Gregory Alan Isakov in the air, I could work for hours upon hours. I've always been a sucker for a good play on words. I was driving home from work one afternoon and the name "Oh, My Deer!" just popped into my head. At the time, I had no reason to use it, but when I was ready to open up my shop, it was perfect. Truth be told, my favorite pieces are either in my bathroom, ready for me to wear since I couldn't part with them once they were created, or they're owned by a friend, so that I could borrow them whenever I want. Ha! You couldn't run your business without (fill in blank) _________? My husband. He's my encourager. He's also the talent behind any of the "good" pictures on my Etsy shop or blog of the pieces I create. I think that makes a huge difference in my work; he makes it look as lovely as it's intended to be! Coffee in the morning, with a healthy splash of Coffee Mate Vanilla Creamer. Then blueberry green tea in the afternoon, especially during the school year. Favorite magazine/blog/daily read? Do you have any other hobbies or creative outlets? CNN and OnceWed. Truly, they're the two sites that I visit every day. And though I've been married for over a year now, OnceWed is just one habit that I couldn't kick. Do you have any other hobbies or creative outlets? Aside from Oh, My Deer!, I'm also the Visual Arts Teacher at a Montessori School here in Nashville. I love, love, love it. I teach ages 3-15, so I'm always kept on my toes! Plus, it's a great way for me to stay fresh with my fine arts skills--the students work with every medium from printmaking to ceramics. Thank you so much Chelsea for participating in the first segment of Behind the Design! i love her designs! perfect for a wedding or any type of party!